As a small business owner, you might feel that the issues you come across are unique. However, no matter whether you own a product-based or a service-based business, there are some challenges that every small business owner faces. To make sure your business stays on the right track, you need to overcome these difficulties. There are many challenges that an entrepreneur might encounter. 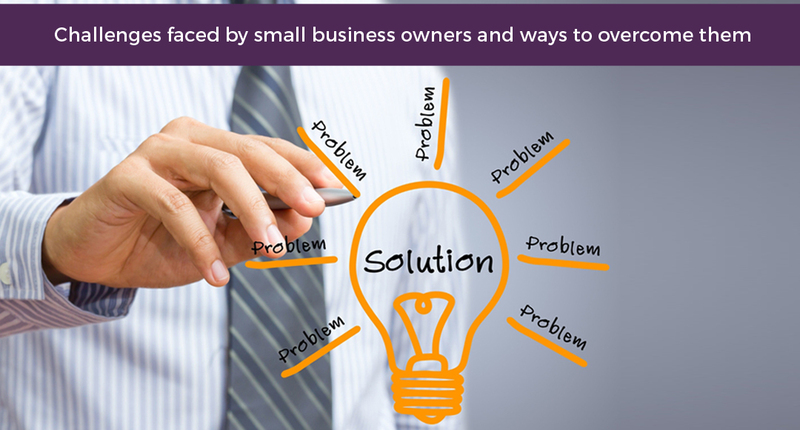 We have compiled a list of five crucial and common challenges that many small businesses face. One of the most pressing challenges faced by companies of any size is finding and hiring great employees. For small businesses, staffing is all the more crucial. Since many people prefer to work in well-established companies, finding employees for small startups and companies can sometimes be a challenge. According to an estimate made by Investopedia, the cost involved in hiring and on-boarding an employee can be 1.5 to 3 times the salary allocated for the position.To overcome this challenge, small businesses can hire freshers with a relevant educational background via campus placements. Alternatively, you can also have an employee referral program, where your current employees can refer other like-minded, talented people. Hiring via social media, like Facebook, LinkedIn, etc., can also be an effective approach. It’s also important for startups to have an interesting Careers page which showcases the life at the company and why it’s an exciting place to work at. From accounting to staffing, most small business owners are often tempted to do everything by themselves. While multitasking is beneficial, overdoing it might cause tiredness and fatigue. This challenge may not get as much publicity as the other financial problems. However, staying energized is a huge challenge for small business owners. To stay energized, you should first stay organized. As a new business owner, it could be difficult for you to have a perfect work-life balance, yet you must thrive to achieve it. Take sufficient breaks and sleep adequately. To ease your work pressure, hire specialized workforce wherever required. Crucial resources, like an accountant, legal advisor, etc., are mandatory as they bring in a lot of knowledge and expertise. Furthermore, invest in tools that will automate services like customer service, financial management, email marketing, etc. Another important challenge that you will undergo as a small business owner is fulfilling your customers’ wants and needs. In other words, to be as good as or better than your competitors you must not only satisfy your customers’ needs, but you must also exceed their expectations. In business, if you are not moving forward, then you are going backwards. Therefore, every business owner needs to consistently come up with new products, ideas, or services that will help them in staying competitive. Therefore, you must be open to implement changes in your business strategies based on customer feedback. This helps in customer satisfaction and retention. Also, to stay competitive, apart from providing customer-centric service, you must also be present on social media as it gives an opportunity to know the pulse of your target audience. Additionally, by being active on social media, you can reach out and engage your customers in varied, unique ways. One of the most significant aspects of owning and running a small business is keeping track of finances. At the initial stages, a manual spreadsheet or a simple money-splitting app may seem to be a natural choice to keep track of finances. While these can be useful for personal use, as your small business grows, these methods of managing money won’t help much. To overcome this issue, one can use cloud-based virtual accountant services that will digitize all bills and manage finances efficiently. Another fiscal problem that many small businesses face is fraud and internal theft. One of the efficient ways to prevent frauds and internal thefts is to minimize cash transactions as much as possible and make use of digital payment methods like mPOS, card swiping machines, UPI, etc. Business owners tend to be busy with a lot of tasks that may demand their attention. Therefore, most of the times, they would be unable to keep track of current trends and news in the sectors relevant to their business. While being updated about every new trend can be a burden, it is necessary. So, you can allocate some time in your weekly schedule to track competitors and read relevant blogs in your sector. You can also create Google Alerts to know about what is happening in the areas related to your business. Twitter Hashtags are also an excellent way to keep up with what’s trending. With prudence and persistence, one can overcome any challenge. If you already have these skills, as a small business entrepreneur, you can boost your business and succeed quickly. What are the other challenges that you have faced, and how did you overcome them?